In his rambling account of the “Sun Four” trial, which ended yesterday with the acquittal of four of the paper’s hacks, Creepy Uncle Rupe’s faithful polecat Trevor Kavanagh sets great store by the words of the trial Judge, Mr Justice Saunders. Kav told that Saunders “summed it up: ‘This is an extremely difficult charge even for lawyers to understand. It’s even more difficult to explain it to a jury’”. He went on “The Crown Prosecution Service should heed his Lordship’s words”, and quoted him in glowing terms at the end of his dirge “‘There is no doubt the Sun achieved a great deal for the armed forces’ said Judge Saunders … The jury, thank goodness, were listening to his every word”. Clearly, paying attention to Mr Justice Saunders is, for Kav, A Very Good Thing Indeed. It’s only a pity that he didn’t do the same. Wait, what? But Kav was not on trial, and nor was he on the jury, so how could he have needed to pay attention to the directions of the trial judge? Ah well. 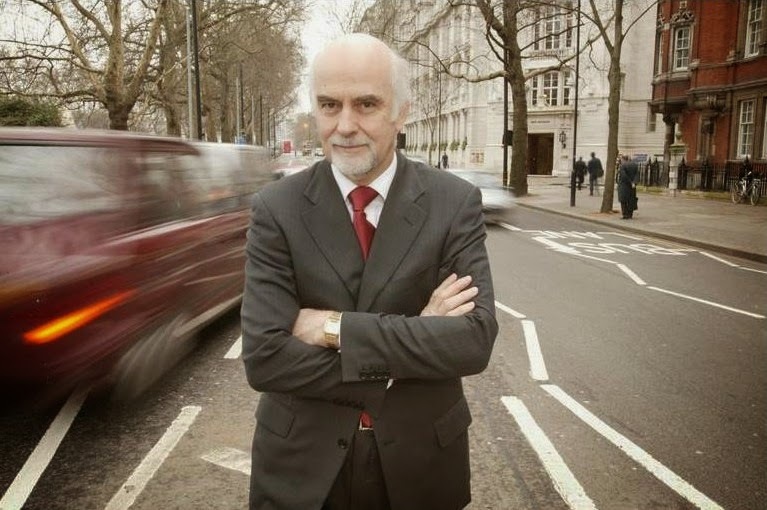 James Doleman, who was reporting from the trial, and who knows a thing or two about court reporting both here in England, and in Scotland, could not report what happened to Kavanagh previously - but as the trial has now ended, all can be told. 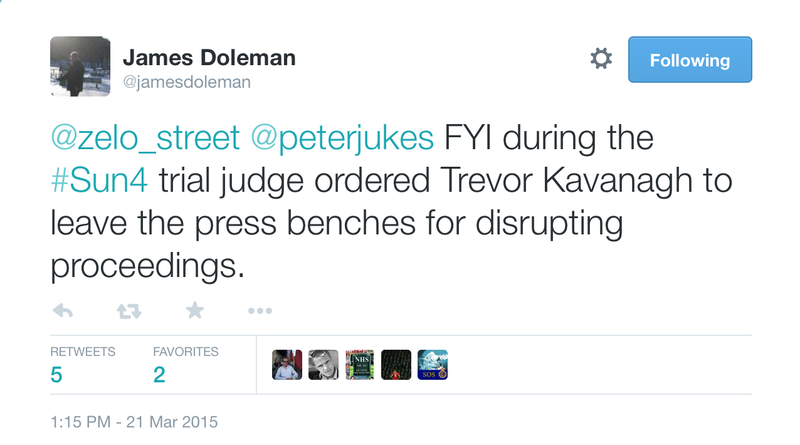 “During the [Sun 4] trial [the] judge ordered Trevor Kavanagh to leave the press benches for disrupting proceedings”, he told. And, as the man said, there’s more: “[the] Judge said Kavanagh was ‘distracting the jury’, [and] was clearly not reporting the case. [He was] made to sit at back of court”. Like being told off at school, then: Kavanagh appears to have behaved like a fidgeting child. Was this right? It certainly was: The Great Man had been wandering around the courtroom waving at the defendants. Now, they all knew him, and some of them might even have been prepared to shake his hand without first taking the precaution of counting their fingers. 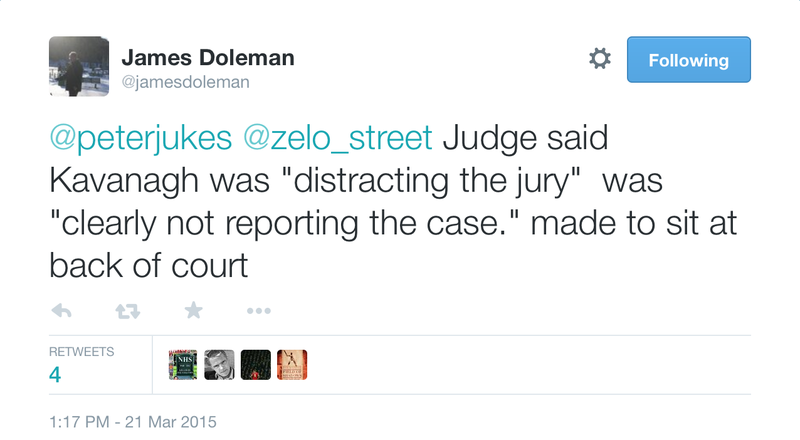 But “distracting the jury” is not acceptable: Kav was lucky not to have found himself barred from observing proceedings. One of my sources was less than complimentary about him. Had Kav been a regular presence during the trial, I asked. “Oh yes”, came the reply. “He was hanging around that courtroom like a bad smell”. So that was it - Kavanagh was a man after my own fart. James Doleman will be writing a full account of the goings-on at the “Sun Four” trial, and when that appears, this post will be updated with a link. In the meantime, anyone observing those who scrabble around the dunghill that is Grubstreet should bear in mind that even the Sun’s own senior staffers can’t disport themselves in a grown-up manner in a court of law. And, unlike Theresa May, I am not making this up. The cream of our free and fearless press on display. What a total and absolute shower. 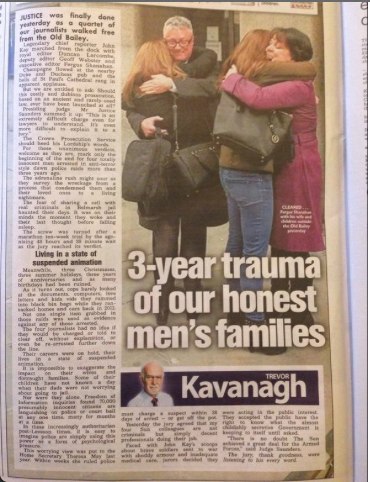 Trevor Kavanagh was the moron who wrote a Sun editorial defending 90 day pre charge detention with words that went something along the lines of 'if they hadn't done something, the police wouldn't be interested in them'. But when it's his colleagues, he's suddenly come over all due process and moral indignation at the brutality of it all.